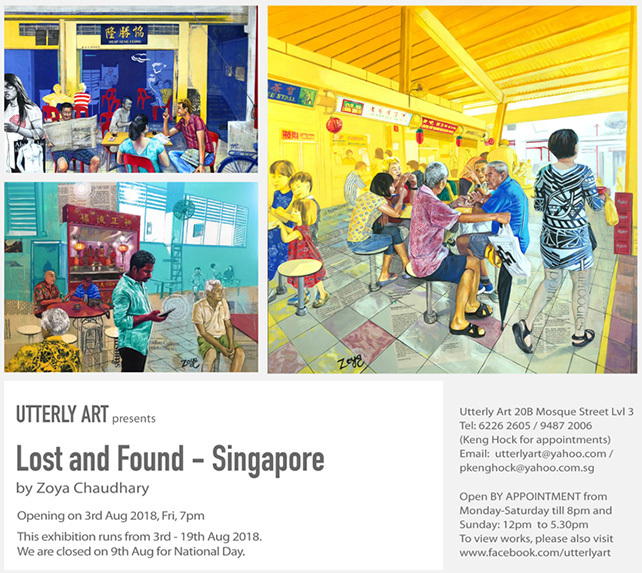 Artist Zoya Chaudhary opens her first solo exhibition titled ‘Lost & Found- Singapore’ at the Utterly Art Gallery in Singapore from 3rd to 19th August, 2018. The exhibition consists of nine art pieces all inspired by the unique, local flavours of the city state. Zoya is especially interested in the visual documentation and celebration of the local character and flavour of places which are rapidly vanishing. In her current series, she explores Singapore stories from her point of view, digging for cultural references and then juxtaposing them to form a seamless visual. According to the artist, her mind splices facts, visuals, news and content together to make sense of places, people or situations. She thinks of herself as a visual writer who puts together a scene to represent the story. As an expat artist living in Singapore it sometimes feels like ‘living in a bubble’, the artist explains. ‘Living in condos and moving around international schools, clubs, malls, watching western shows and global news can make one feel completely disconnected from the local community. Newspapers and the media are the only sources of knowing what goes on locally. That’s why I’ve used actual newspaper articles as a key part of the narrative in constructing my imagery.’ Acrylic paints and cut-outs from local daily newspapers are collaged onto canvas and treated with medium and varnish to form the primary materials for her paintings. Zoya has explored many neighbourhoods of Singapore, first by reading about them, and then visting these places physically. 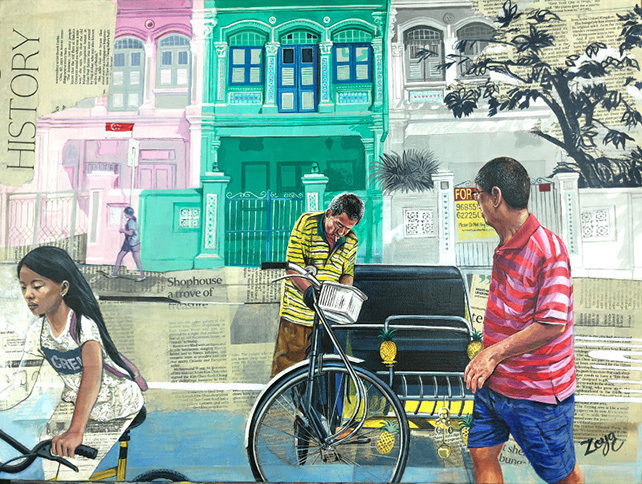 In her exhibition Lost and Found – Singapore she depicts everyday scenes from various parts of the island that have a very local flavour. 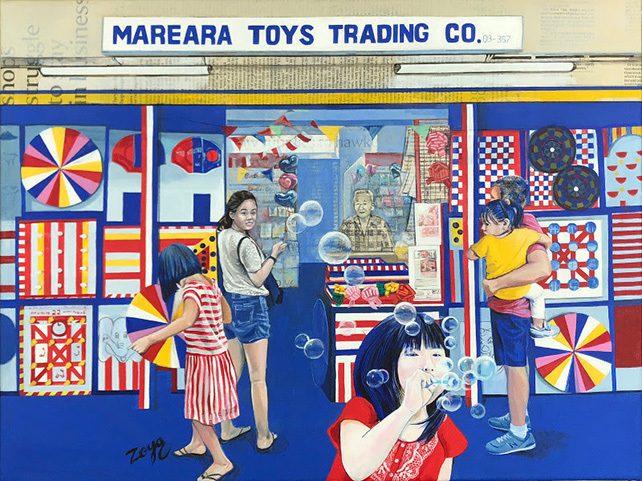 Some of the works show places that have very recently been demolished, like half a decade old kopi shop, Heap Seng Leong & Mareara Toy Shop, giving urgency to her mission of adding these sights into our visual memory.